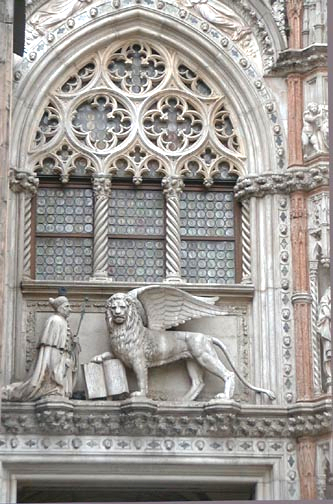 Situated on the left corner of Palazzo Ducale facing the piazzetta, this magnificent gateway is surmounted by a beautifully carved window and a bas-relief, similar to that which adorns the balcony and window at the center of the main façade, in which the Doge kneels before the lion of St Mark. The relation of Doge and lion of St Mark can mean several things: first, that the ruler of Venice professes his subservience to the city-state, of which the lion is the symbol; second, that he does the same before the city's patron saint, which is not quite the same thing. And, finally, that Venice's elected ruler shows his allegiance to the Christian Gospels and possibly to the Church itself — but, given Venice's notorious defiance of Rome, this last hardly seems too likely as a principal meaning.